Thanks so much for using GoodStuff. We hope you love the product as much as we do. Feel free to share your experience with the community below, and please don’t hesitate to get in touch if you have any questions. "So much more than a protein powder." "I am a huge fan. Great local Canadian product." SUPPORT LOCAL: Handcrafted in Oshawa, Ontario, Canada. Chocolate Chaga GoodStuff Smoothie: a nutrient-dense, easy-to-digest superfood mix that tastes amazing! Packed with plant-based superfoods and supergreens, it is an essential step to getting energized and focused. It contains powerful antioxidants, strengthens the immune system and provides gastrointestinal support. GoodStuff is a smoothie mix for the people. It offers maximum flavour, protein and health for all. Chaga mushrooms are known for their immune boosting and digestive properties. The Chaga mushroom in GoodStuff is sustainably harvested from the Laurentian mountains in Quebec. My husband and I are on the ketogenic (low-carb) diet and were so pleasantly surprised by how the Good Stuff fits right in to our lifestyle. We wake up and make a smoothie with almond milk and berries and are good to go. The Good Stuff tastes delicious and supports our active life. Thanks for sharing. LOVE the product!! I have it in my shake, keeps me full in the morning. I've just placed another order! Thank you for creating a healthy & delicious product! Excellent product!! I use it in my morning smoothies, tastes great. Ships quickly, I usually receive it within two days of ordering (in Toronto). 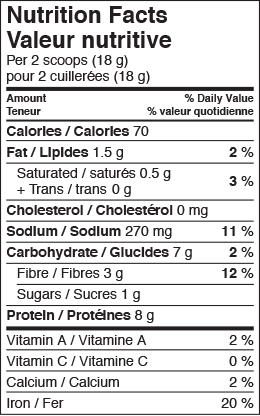 I've tried a lot of protein powders and this, by far, is my favourite. It is delicious and the ingredients are superb. I love supporting local businesses too. Win-win! This mix is the best one I have ever tasted. My daughter and I drink it everyday! I strongly recommand it. Great job Vira One Team!! Good for your energy and it gets you through the morning and in to the afternoon without craving any other foods. I personally love sweets but it helps you not craving those sweets so you can live a healthy life style! This is one of the most delicious protein powders I have ever tried! Besides the fact that I'm a chocoholic and this is an easy and healthy way to satiate my craving, I also feel good knowing I'm getting so many nutrients in my body with one or two small scoops. My favourite way to drink this is blended with some coffee and soy milk — it makes a delicious mocha latte with some sneaky protein. It's so delicious, it doesn't even taste healthy! I also love that this is a Canadian company. It makes me so happy to have found a delicious product that I enjoy, while also supporting local business. I CANNOT live without this! I am a holistic nutritionist and use this product personally as well for my business because I love the taste but more importantly the impact it has on my health. It gives me and my customers so much energy and nourishment. GoodStuff is a game changer for energy, mood, mental clarity, overall wellbeing and I would recommend this product to anyone, at any age and stage. I absolutely LOVE the Goodstuff!!!! I've tried so many protein powders and this is by far the best, I love the taste and all the quality ingredients. I feel healthier, have more energy and even sleeping better since I've been taking it. I'm so happy I found this!!!!!!! I ab-SOUL-lutely LOVE your mixture and consistency of GoodStuff!! I've tried pretty much every smoothie/protein powder mix that's out there, and as soon as I tried yours there's been no turning back (and I also like to keep a little stash in the house so that I never run out). Wish you a joy filled day! I picked this up at the Yoga Conference in Toronto and we absolutely love it! I appreciate the quality ingredients and feel confident that my daughter can safely add this to her smoothies. 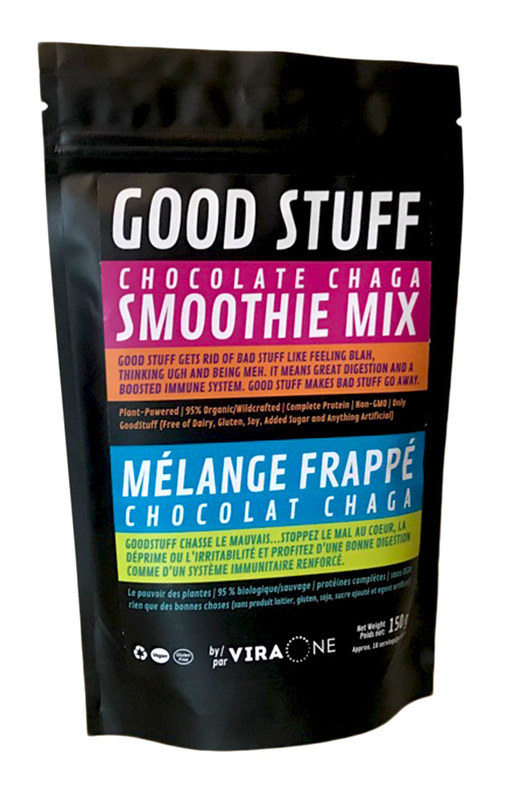 I was introduced to the Good Stuff Chocolate Smoothie mix last summer at Lululemon Queen Street while attending a Nutritional Class Held By Joanne Gerrad Young from The_Healing_Cuisine. I was given a sample and immediately knew my two young daughters would love the flavour. With a simple recipe to follow, they now make their own morning smoothies. Banana, almond milk, raw honey and of course a scoop of the Good Stuff. This smoothie contains a whole lot of health benefits. Chocolate Chaga smoothie mix is REALLY good and it is very good for you ( full of antioxidants, great for the immune system and tastes great). I absolutely love the Good Stuff and playing around with what I can put it in next. It's flavours can make a flavourless smoothie delicious with just one scoop. It's nutrients fulfill me, as I hardly have time to eat while managing a busy day, and with just one scoop blended with my bulletproof coffee I'm energized and focused to the max. We love supporting this lovely family owned, local business. This is by far my favourite protein powder! It blends well, and the chocolate flavour is not too overpowering! I found out about the GoodStuff through Twist Whitby and went a long time before trying. So happy I finally was able to get my hands on a sample. I will definitely be using this as my go to!! This is really “GoodStuff”! I’ve tried many protein shakes over the years, and I definitely have to say that ViraOne is the tastiest that I’ve had! Not only that, it’s SO packed with GoodStuff that I feel extremely energized, awake and ready to take on my day when I have it. I care about supporting local companies doing good things in the world - check out ViraOne.com to see how the company supports an incredible charitable organization, New Leaf Foundation, that is near and dear to my heart. I just ordered 10 bags of Vira One to give out in my Christmas Gift Baskets. It is a great addition to the other items that show my friends and family that I care about their health. I am really looking forward to getting my order and of course, one bag is just for me! I know that the ingredients in this formula will help with so many things over the holidays and keep me from getting that dreaded "holiday hangover" that adds to fatigue, weight gain and inflammation. Thanks to ViraOne for making such a high quality product and I love the fact that is is created and formulated in Canada. I'm really tired of dealing with Customs and currency exchange. Put ViraOne on your Xmas list and love the fact that you are doing something so fabulous for your health and well-being during the holiday crazies. I'm also going to add some of this mix to my Xmas chocolates and bliss balls. First tried this shake mix at a health fair in my home town and was hooked! It's very tasty, not grainy , a great source of protein and it contains super foods. Truly and amazing product that I repurchase frequently 🙂 and my whole family enjoys it !! Good Stuff is exactly what this smoothie powder is. A superior delicious nourishing vegan powder that everyone can appreciate and enjoy. We are proud to have it in our vegan boutique at Aux Vivres. This is my all-time favourite smoothie mix. The flavour is smooth, delicious and chocolatey and it has so many great ingredients in one mix for a real overall health boost. Can't beat it! Just wanted to let you know that we are really enjoying the product and have ordered more. My husband has been making the smoothies for his breakfast which is great as he is a junk food eater and it has had an impact on his health. This is a start towards healthier eating for him which makes me very happy. I have also started to use it with Almond milk and it is very tasty. Thanks for a terrific product. As a competitive triathlete, active skydiver, yoga practitioner and teacher I really value and rely on my body to perform the way I want it to. I think of myself as an all around athlete, meaning I am always on the lookout for an all around protein mix. So needless to say when we started stocking The Good Stuff at the studio where I teach, I was very keen to give it a try. Up until that point I had basically written off any type of protein powder, whether it be the infamous chalkiness of the average product, or the sub par quality ingredients involved, I never found one I actually enjoyed. After I tried the sample of the Good Stuff, I knew it was going to work for me. Fabulous flavor, Excellent ingredient list, covering a wide range of nutrients for a balanced blast of goodness, sourced from very reputable suppliers, zero junk added. Just the Good Stuff! I felt confident switching from my usual pre-race breakfast routine of toast and peanut butter to a banana, blueberry, almond milk, Good Stuff Shake and don't have any plans on switching back. Lastly, how great it is to have such a quality product available from a local source, these people really do care about what they are producing and it clearly shows. My recommendation to anyone is to please just give The Good Stuff a try, if its not for you that's cool, but I have a strong feeling that once you taste it you will come running back! 5/5 and recommending it to everyone I know. Stay active, stay healthy, have fun, rock on!